Oil Skimmers was chosen to supply 23 Model 6V oil skimming systems for a large international oil and gas company that has undertaken a multi-billion dollar investment to generate power for the Asian-Pacific market from coal seam gas. In a record 120-day turnaround time, Oil Skimmers met the customer’s rigorous engineering and design requirements, involving the customization of 23 Model 6V oil skimming systems, which use floating collector tubes to remove oil from wastewater. The Model 6V BrillTM oil skimmer units are used in conjunction with sumps to remove any oil that may appear in processing wastewater to proactively manage any potential impact to the environment. 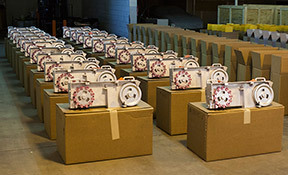 “Our remarkable sales, engineering and operations teams met the customer’s stringent commercial and technical requirements, as well as a challenging timeline for shipment halfway around the world. We provided creative solutions to help them better manage plant maintenance and the environment with the highest reliability at a competitive price,” said Michael Gaudiani, chairman of Oil Skimmers, Inc. and managing partner of Danville Partners, LLC, a lead investor in Oil Skimmers. The Model 6V oil skimmers are able to operate independently 24/7 to help ensure that wastewater potentially discharged from gas production equipment is kept free of waste oil. Oil Skimmers, Inc. engineers and manufactures the original tube oil skimmers. The oil recovery systems can be customized, sized to any specification and remove waste oil continuously. Durable construction and a rugged design ensure trouble-free operation 24/7 in a wide variety of industries and applications worldwide, including steel, mining, power and energy, and food production. With thousands of systems in operation, some for more than 30 years, Oil Skimmers, Inc., provides reliable, cost-saving oil skimmers with excellent customer service and support. Danville Partners, LLC invests in and manages smaller middle-market B2B companies. Working in partnership with the existing owners and managers, or assisting owners in realizing successful succession plans, Danville is focused on building and growing entrepreneurial companies both organically and through add-on acquisitions, to achieve their maximum potential. For more information, visit www.danvillepartners.com.